Save Money at Disney: Don't Pay for These Items! A few days ago Tammy Whiting wrote a great article about Things You Shouldn’t Pay for on a Disney Cruise. Today I take that idea and apply it to Walt Disney World! Here are some purchases to avoid to save money at Disney. Some of you might think, “Hey Claire, everything is expensive at the Disney parks! You just have to deal with it!” I agree with your statement, but there are always things that are just a little too ridiculous, or a little too much like a nickel-and-dime scheme, or WAY too expensive to warrant even being put on the shelf or promoted by the company! Walt Disney World’s parking is huge and sprawling. They have always accomodated the early riser and the late arriver by shuttling people with their tram system to roughly the spot where their vehicle is located. If you are close enough to the entrance, you can just hoof it to the security checkpoint. Disney’s commuting guests have grown accustomed to this arrangement. However, one year ago Disney decided to provide an up charge by giving guests really, really great parking spaces for just $20 more! 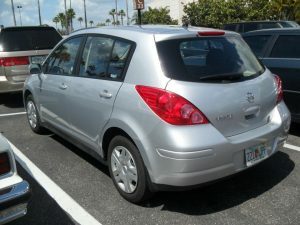 I need to remind you that parking for a Disney park in Florida is already $20, so if you want the best spot in the Mouse House you have to double your parking payment. $40 paid for the day and you haven’t even made it to the entrance yet! I have parked all over the lots at Disney and in all sort of podiatric conditions. The trams do a lot of the heavy work – use them if you have to! Don’t sacrifice a Mickey moment in the park because you spent that extra $20 outside the park. When you go up to the counter for the first time at a quick service dining location in the parks, you might deal with some sticker shock. After all, most of our national fast food chains aren’t quite to the point of charging $10 for a combo meal. (…Yet…) But that doesn’t stop Disney. 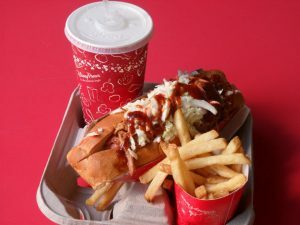 The main meals at places like Casey’s Corner in Magic Kingdom park or Pizzafari at Disney’s Animal Kingdom are $10 or more – and that doesn’t even include the drink! This isn’t as huge of a cost-cutting measure as the parking, but remember that it will still save you a couple bucks, and it could help your belt a little, too. Disney rarely posts that you can order just the burger or just the chicken nuggets, but you can, and the cast member will knock off some of the price at the register. I now have two nieces (with a third niece or nephew on the way) and I have declared them the best babies ever in the history of the whole world period. (Period!) So when I went to Walt Disney World last summer with my parents, we wanted to find some cute baby outfits. Notice the price? I would bet the adult is going to get more use out of a shirt of the same price than the child. Children under the age of three grow at a rapid rate, and purchasing clothes for them is more like playing a game of roulette. Will the baby be that size when this weather is taking place? Or – more likely – how long will the baby be this size anyway? 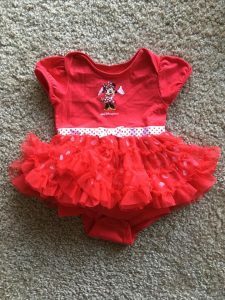 Etsy has amazing Disney-themed baby clothes for a slightly more reasonable rate (plus it supports creative people), and Disney-themed clothes are all over budget-friendly stores like Wal-Mart and Target! The clothes can start the Disney conversation, and it’s completely up to you if you want to say where exactly you purchased that outfit. For long-term guests a movie might be a pleasant break from the Disney crazy. However, most guests are in Walt Disney World for a week or so. I have taken a break from the Disney crazy, but I didn’t need to spend $20+ to do something that I can do at home. Instead, I just turned on my television, which is conveniently included in the price of your hotel. Between sporting events, movies, and weather, I could take a breather and not spend more money. One TP staffer calls refillable mugs portable petri dishes of fun. I did get sucked into the refillable mug craze back in 2010, but I didn’t get the most out of the money I spent. 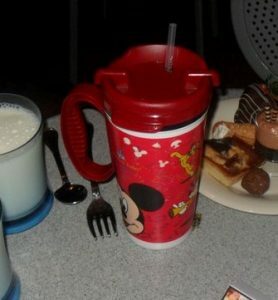 I rarely was at the resort to refill my mug, and all I wanted on those hot June days was water! I wised up last year and just brought a gigantic water bottle, and it was exactly what I needed. When you think about how many times you’d need to use the mug, and also think that you would need to make a trip to the food court every time you wanted a refill, the idea of the refillable mug starts to not look very appealing – especially not at a $18 price tag. Moreover, do you really trust the “washing stations, which would more accurately be called “rinsing stations? At home, you don’t just rinse your dishes for a week instead of washing them. And sugary syrup probably isn’t a good thing to put in a body in need of hydration – just take a water bottle and get free ice water. Before each of its nighttime spectaculars, Disney wheels out its magical light-up cart full of hats, crowns, twirly-ma-bobs, and swords to entice the kiddos in the crowd to sidle up to their parents and say, “Pleeeeeeeeease?” Disney hopes that the exhausted parent will purchase something to make the kids happy while they wait for Anna and Elsa to come down the street or Mickey Mouse to shoot fireworks from his fingers. This stuff is all trap merchandise. Don’t let the fact that they wave this stuff in front of your children keep you from standing your ground. The best advice I ever heard on the subject was to purchase your own nighttime glow merchandise before you leave for Florida (or purchase it at a local Florida store). Hide it so the kids don’t see it, and then break it out when their eyes start to twinkle at the Disney twirly-ma-bob with its retail price of arm-and-leg. Chances are your unique glow merchandise will be the envy of the kids around you that all have identical light-up swords. Disney dessert parties contain many varieties of desserts. From cheesecakes to fruit tarts to chocolate, every dessert lover’s desire is granted. (They even have milk!) If dessert is your goal, you can enjoy as much as you want and it’s pretty delicious. However, if the goal of a dessert party is the show, then you might want to just camp out in advance at the best location, because it’s pretty likely that the dessert party viewing area isn’t going to be the greatest. I did the Wishes dessert party a few years back at the Tomorrowland Terrace, and since I had booked it so early, my friend and I had seats right at the front. But those with tables in the back still had to get up and stand behind us to watch the show…just like they would have if they hadn’t been at the party. This is a question of spending time vs. spending money. In my opinion, time wins out for that picture perfect view. 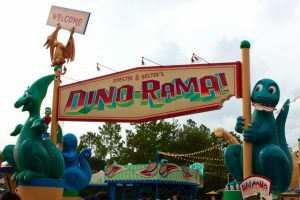 Specifically, I am talking about the games you would find at Chester and Hester’s Dino-Rama, but you will find them a few other places too. These are games that are typically found in random theme parks across America as well as boardwalks, circuses, and fairs. People throw, squirt, or move something, and if they win they get a giant stuffed animal. Which you will then have to carry around the park. Possibly in the heat of summer. The reason Disney even has this area in Animal Kingdom is because of the amazingly detailed theming of the area that makes it resemble an off-highway tourist trap. (Maybe too amazingly detailed?) That doesn’t mean you have to waste your money ($4 per game) to be immersed! Save (and make!) money by teaching your kids how to set up their own 3-Card Monte games out of sight of Disney security. Do you have any other items or experiences to add to the Walt Disney World list? Disagree with anything I’ve mentioned above? 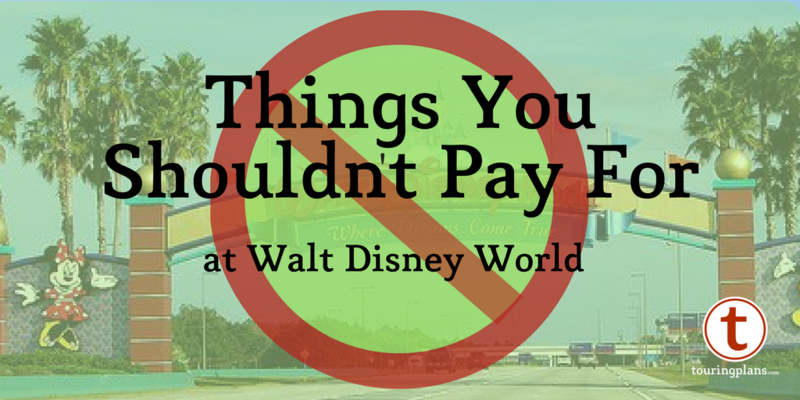 Have you ever paid for something at WDW and regretted it later? Let us know in the comments below! I've been enjoying Walt Disney World since my Nana pushed my sister's and my strollers back in the late 1980s. I enjoy my day job here in the Denver area as a teacher and music coordinator at our church. I love music, reading, Doctor Who, Star Wars, and Michigan sports! Ask It: Are Preferred Rooms Worth It? Is this a typo? “I would be the adult…” . Thanks! Disney has never broadcasted the a la carte option, but it pays to know. I like the refillable mugs. Out family did spend plenty of time at the resort (many meals, pool breaks, activities) and we like drinks other than water. 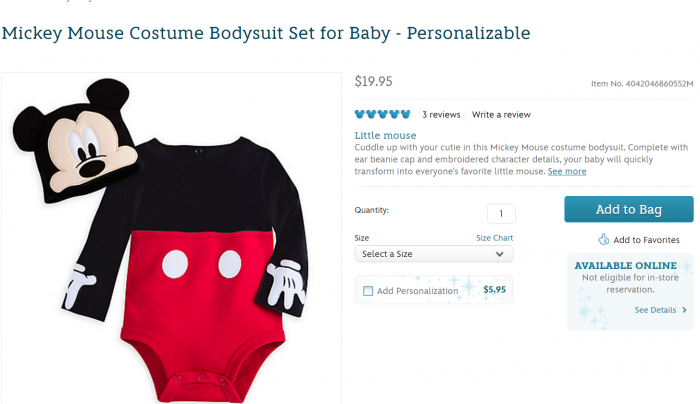 “Etsy has amazing Disney-themed baby clothes”. Do Etsy folks get licensed from Disney? There are TONS of those that do not pay out to Disney. Paisley Punkins is a huge one of them. They delete comments that question it too. We like the refillable resort mugs especially for coffee in the morning. We stay at Pop in a preferred room so easy walk to get coffee each morning to bring back to the room and get ready for the day. It’s also nice if that is all you are getting to not have to get in another line and pay. I can definitely see when they don’t make sense though also depending on how far the food court is from your room and families drink preferences while at the resort. It does depend on how much time people spend at the resort. For the majority of people who stay at Value resorts, it’s a place for sleep and a swim. Those who stay at Moderate and Deluxe resorts might be spending more time at their resort, which would make a refillable mug worthwhile. I personally have found it to be not worth the price, and many people I have talked to say the same thing. But the thing is even if all you do is sleep and swim the break even point on the mugs is pretty low. If you do a coffee in the morning (no coffee makers in the value resorts) and a soda at break or at night, you’re at about $6 a day. So the break even would be two drinks a day for about 3 days. I’d actually say it’s a value savings if you drink things other than water. Tylenol. Never pay for headache medicine. If you go to first aid they will give it to you for free. Also bottled water. They give free cups of ice water everywhere. 1) Souvenirs. Years ago, a friend of ours gave us the great tip of buying a bunch of souvenirs ahead of time for the kids, bringing them secretly on the vacation, and then giving them to the kids periodically during the trip. You can save a ton this way! Yes, there are some special, limited edition items that you can only get at the parks, but much more often than not you have a kid who just wants something and doesn’t need to get a limited edition Beauty and the Beast mug that can’t be purchased elsewhere. We jump on to Amazon before the trip and buy everything in advance for much, much cheaper. Kids are just as happy. 2) Experiences where Disney dresses your kid. Even for Disney, it’s shocking how much things like the Bibidi Boppoty Boutique charge for dressing your kid and putting on makeup. But a costume when on sale (like after Halloween), bring it with you with some makeup, and surprise your kid with a new outfit and have the appropriate parent do the makeup. 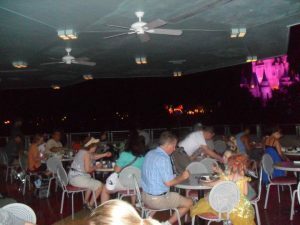 There is an option for a Plaza View Wishes dessert party. You get to have the same desserts as everyone else at the Tomorrowland Terrace, but you’re escorted to a reserved section in the Hub to view Wishes. It has the advantage of a better viewing angle in an uncrowded area, and it’s cheaper than the terrace view party. Wow, great suggestion, I had no idea, thank you! Agreed! Both of these are great additions! Even if you don’t carry a refillable bottle ask for ice water.. Every counter service I’ve been to will give you free ice water. Saved my life last July when my daughter told me this, also good for dunking a bandanna in and putting on your neck to keep from passing out. She also showed us the kids meal option, whenever we eat at Harambee Market she gets the kids meal, the ribs in it in are like the ones at flame tree rather than the karubi ribs one piece instead of two, and it comes with apples and a cookie, the other thing we do is get one meal and share if we want the same thing. There’s usually plenty and if not I figure that saves enough calories and money for an ice cream later. We’ve always done the cups too at the resort but I agree I really think you’d have to be there for the whole time they’re good and use them a couple times a day to get your money’s worth. And if you stop by in the morning you have to go back to the room and ditch the cups or figure out what to do with them all day, if possible one trip to Walmart for drinks for the room and lots of ice water in the park saves a ton of money. Also snacks for the room, so many times we waste money on something to eat in a park in the morning because we get there starved when an apple or breakfast bar would have held us until we actually wanted to eat. Love the tips and the books and app! What about Disney Autograph books? Another great one! Thank you! I have to argue, just a teensy bit. My parents got me a Disney autograph book when I was 4 years old. I used that same book on every trip until I filled it up at 20 years old. Some of my favorite character interactions involve the characters looking back at my beat-up book and commenting on how cool it is! I would say that was well worth the $20 or so. I was hesitant to get a new one, but a friend gifted one to me for my birthday, and I hope to keep the second one just as long! For drinks, we bought refillable bottles at Walmart that had a pouch that we could feed the strap of our fanny packs through (yes, we wore fanny packs,and they were filled with food). We would freeze the bottles with Gatorade or flavored water the night before, and as the ice slowly melted we had cold drinks throughout the hottest part of the day. Much cheaper, too! The greatest freebie at Disneyworld is ice water! Any stand that serves soft drinks in cups will give free ice water. No need to spend 5 bucks on luke warm bottled water. This has been our most money saving discovery at WDW. If you want cheap drinks throughout the day that are not plain water, buy those little powdered flavor packets (Crystal Light, Hi-C, Koolaid, etc.) at the grocery store. A box of 8-12 is about $2. Get a free cup of ice water from Disney, then dump in your flavor packet and suddenly you have ice cold lemonade, fruit punch, iced tea., etc. Water is DEFINITELY the best thing not to buy at the parks. There are so many ways around it! Thanks for the input! Does your opinion change with the Wishes Dessert Party Garden Viewing? I decided to not do the Terrace because I read people say the view wasn’t the greatest so went with the Garden View which is right in front. Opinions? If the Hub is the location, then it certainly sounds much better than the terrace! However, I still prefer my fireworks to be a little further back to really enjoy them, like between Casey’s Corner and The Plaza restaurant. The viewing area in the Hub is in the part closest to Main Street, so it’s as far back in the Hub as it can be (it’s one of the old Fastpass viewing areas when they did that for Wishes). Granted, it isn’t quite between Casey’s and the Plaza, but it’s pretty close. We think the viewing is quite good from there, as the castle is centered. And there’s plenty of room for everyone to spread out and have some elbow room – no crowding at the railing. I’ve sometimes wanted to go to the midway games and ask if I can play the game just for fun and not try for a prize. I’m assuming I’d be politely turned down. If you don’t want the prize I’m sure you could give it to a random kid. That would be a nice way to spread the magic! As others said, don’t pay for water when it’s free at any CS location. Don’t buy rain ponchos — buy a few at your local Dollar store (while you’re picking up glow sticks and sunscreen) and keep them handy for rainy days (or for rides on Kali River Rapids). Don’t buy coffee, if you’re staying in a resort room with an in-room coffeemaker. I jazz mine up with flavored powdered creamer brought from home. Don’t buy autograph books — bring homemade ones from home, or purchase them from the Disney website on clearance ahead of time. My daughter is long past the stroller age, but I have always thought that renting a stroller at WDW is not worth it, primarily since they are only available once you are inside the park. Much better to bring your own from home, or even get a cheap $20 umbrella stroller you can buy at a local store( I’ve seen them on sale at a Publix on International Dr). This way you have it to transport exhausted kids for the long trek back to your room at the end of a tiring day. This is a great tip! We did it when our kids were small. And when we left Florida, we dropped the stroller off at Salvation Army and got a tax donation receipt! Much less expensive and more convenient! I read a tip once which we have used two or three times at Midway Games, since our kids had always wanted to play them. We played first thing in the morning and chose games that you play against another person. Our two kids were the only ones playing, so one of them always won! They were thrilled. Another great money saver for souvenirs is the Outlets. Granted, you have to have a car to get there (we live in Ga and usually drive). There’s lots of clothes and toys for a discount.